It's simple - just add Frank's Red Hot. You already have butter in there. Bam! Tasty cheap eats. 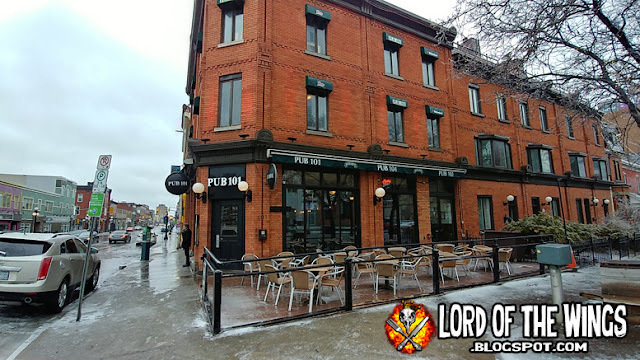 Happiness Happened Here: "Flesh & Blood"
I don't make it to the Vanier* area of Ottawa often, but when I do I'm always on the lookout for more eateries and wings. 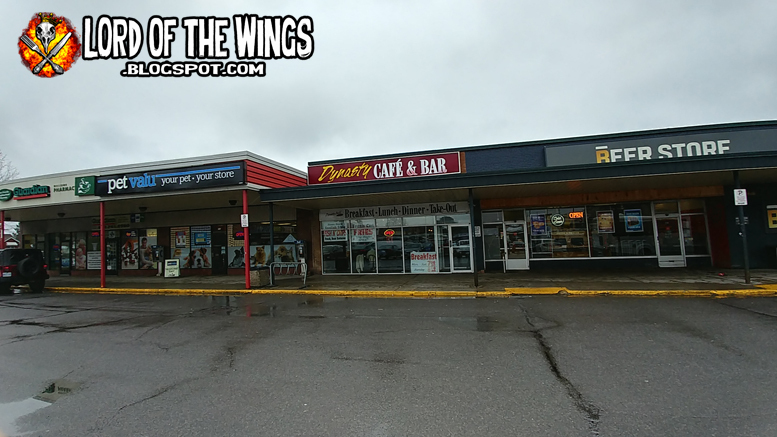 I've been to the Montreal Square strip mall a few times, where there is a McDonald's, a shawarma place, a pizza place; the usual fare. 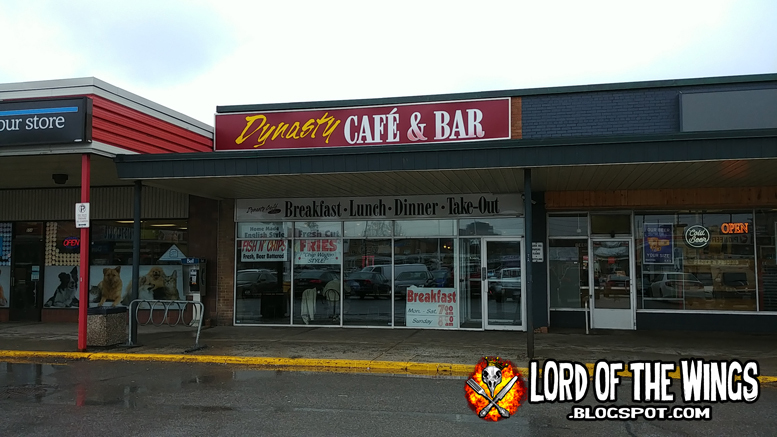 They also have a little dive place that looks like a coffee shop called Dynasty Cafe & Bar, but I never gave it much notice because I didn't take it for a wing joint. Then a few weeks ago, one of the foodies in Ottawa I follow on Instagram (@getfatwithlabz) sent out a shot of an onion ring poutine that looked pretty good. That led me to search for Dynasty itself, which has it's own Instagram account (@dynastycafeandbar) and low and behold, they had chicken wings! Dang they looked good. 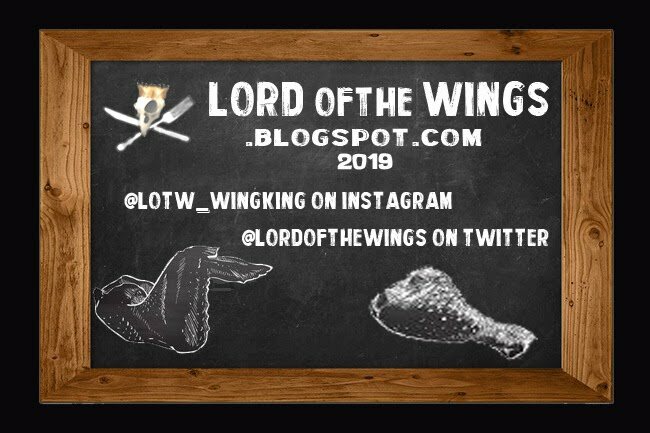 Well that was it, it was time to try some wings! 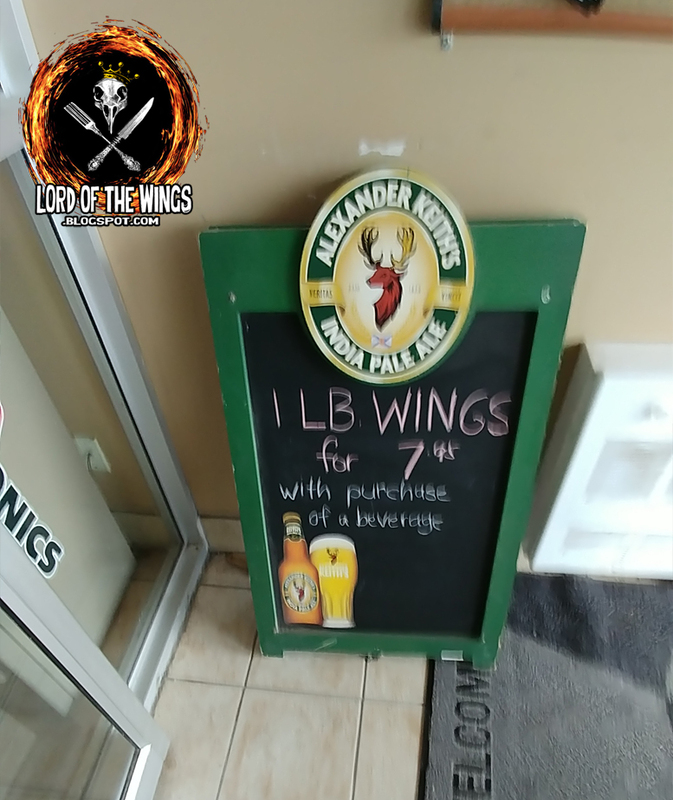 I walked into the cafe out of the rain, and noticed this message board in the entrance - 1lb of Wings for $7.95 with the purchase of a beverage. Nice! Or so I thought. The inside was much bigger than expected with a lot more seating than I thought it would have from the outside. It's mostly table sitting, but there is a bar. 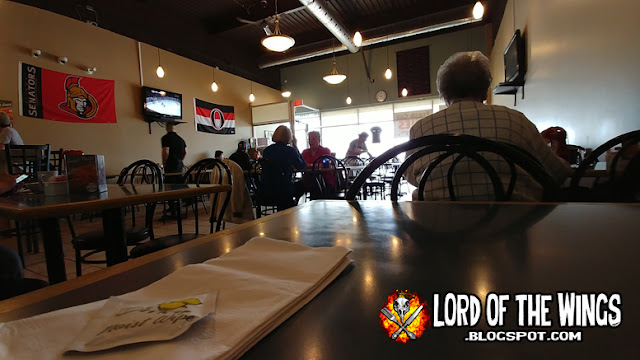 One wall has no decorations except for a TV, the other another TV and Ottawa Senators hockey flags, and another wall has specials on it. It was really dark inside. I don't know how to really describe the atmosphere here but it was kind of hum drum. The crowd on this Thursday noon time was overwhelmingly elderly and I'm pretty sure all French. The staff spoke French with everyone, but I must have stuck out clearly because they just started speaking English with me. But I was prepared if I had to be; chicken wings is 'ailes de poulet' in French, FYI. The menu is pretty diner standard - fried apps, club sandwiches, fish and chips etc. 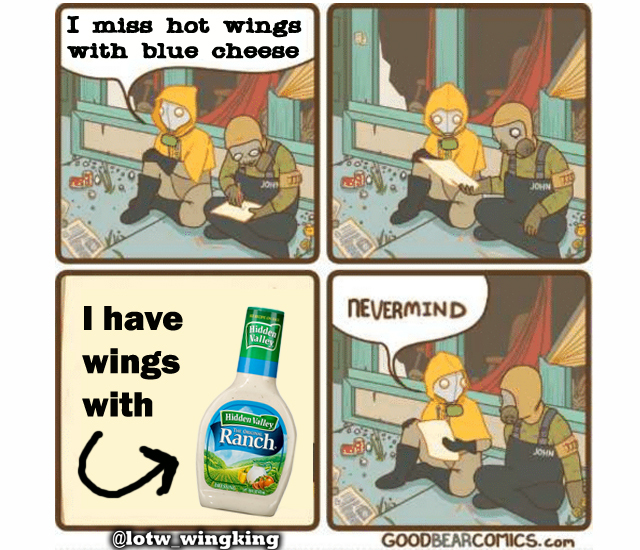 Of course I was looking for wings. No flavour description though. The only waiter, a young guy who seemed to be in charge but was very friendly, came to take my order. 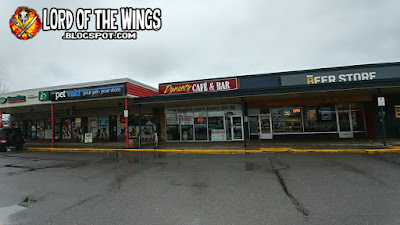 I asked about the sign out front for the wings, and he told me the deal was only in the evenings when the board goes out on the street. Dang. He also wouldn't clarify a specific time that the special is, only every evening. 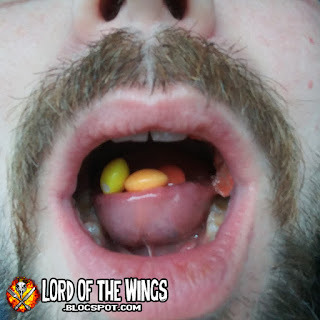 He ran through the flavours, "hot, mild, medium, BBQ, honey garlic . . . or we can mix them if you want". I was good just trying the hot. A few minutes later he brought me some napkins and a wetnap. He also brought me my drink, and a little bit after that my meal. It looked pretty good! I also got a side of onion rings. The pics of the onion ring poutine looked good (which is not on their menu, must be a special request by regulars), but I didn't need that much for lunch. The rings were good. 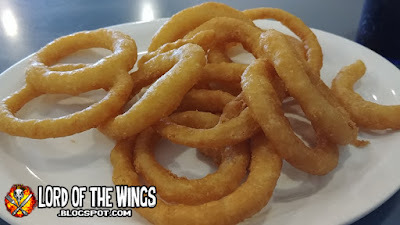 I would have liked the rings fried for a few minutes more to be really crisp, but these were still good. 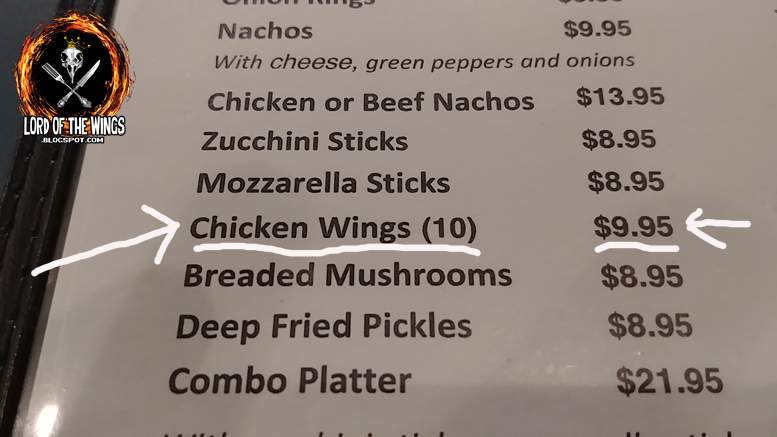 Wings only come in an order of 10. The wing special says they serve the wings in a pound. I don't know if the 10 wings are a pound or not. 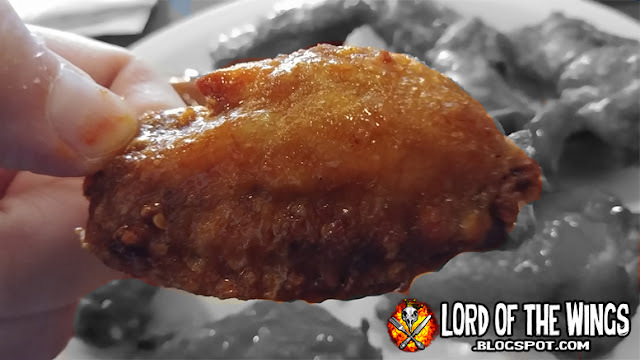 The plate is served up just straight wings - no celery, no carrots, no dip. 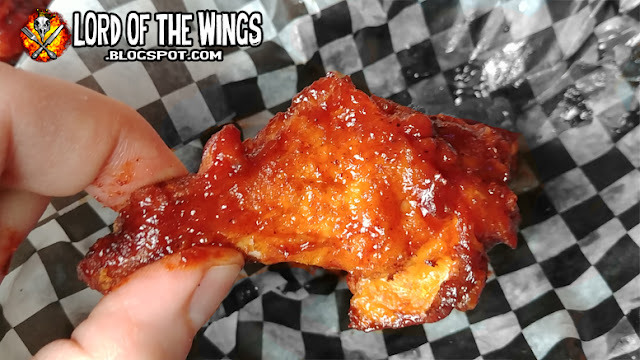 The length of these wings were a medium-medium plus which means they are a decent size. On the meatiness scale, they were mostly medium but there were some VERY meaty drummettes. They were so big, the cook has taken a knife and cut open the meat, leaving a deep cut in them. I'm pretty certain this was done to ensure the chicken cooks evenly or at least, completely. 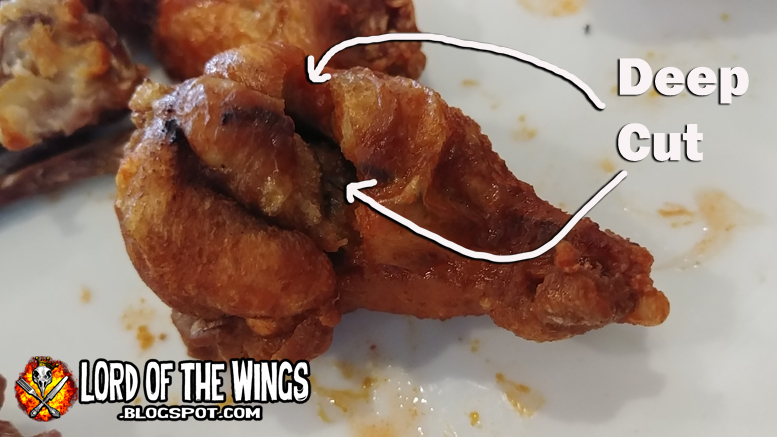 It looks odd to have this big gash, but I'd rather the unusual gash to under-cooked wings any day. 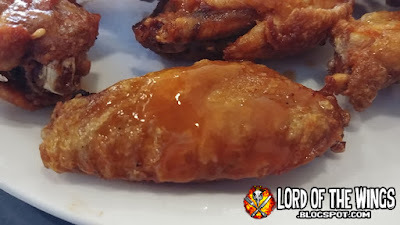 The wings are deep fried straight up, no dusting or breading going on. 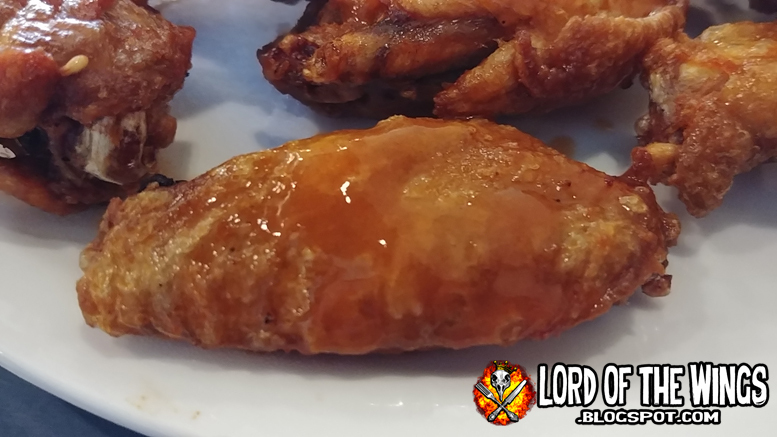 The skin was nice and crispy - cooked just right and they held up to the saucing of the wing. The sauce is simple cayenne based hot sauce. Probably Frank's. So it's nothing special, but it's good. 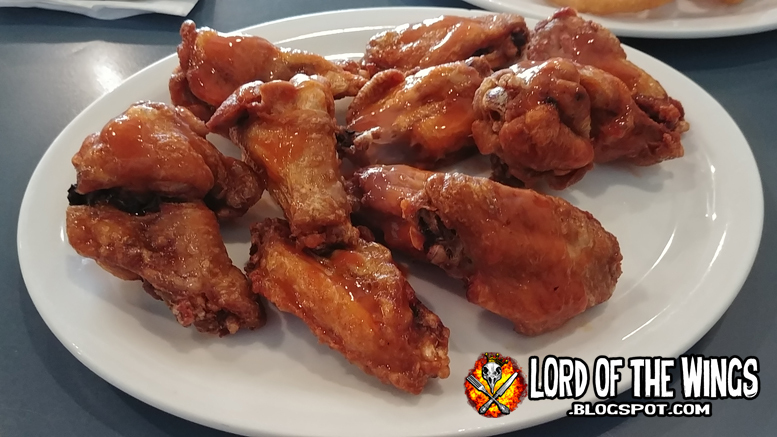 There is enough sauce on the wing that they were pretty wet, but a few were under-sauced as I like a lot of sauce. I was expecting the kind of saucing I saw in their Instagram post, but the wings were good at this level of sauce. Would you try Gold-Dusted Wings? 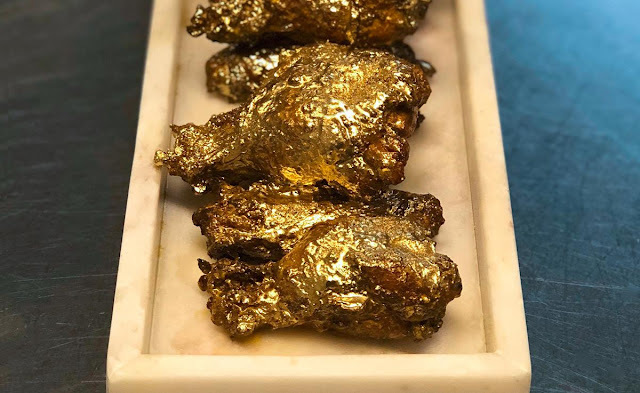 The Daily News is reporting that New York eatery's 2 locations of The Ainsworth are serving the gold-dusted wings. Created in collaboration with chef Foodgod (Jonathan Cheban), these wings are the epitome of elite treat. "The prized poultry pieces are first soaked in a mixture of coconut butter, gold butter, chipotle and honey batter for 24 hours. 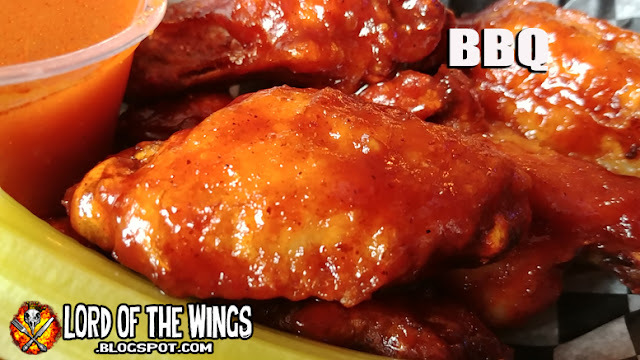 Then, real gold flakes are sprinkled on top of the wings before they’re served with a side of gourmet dipping blue cheese. 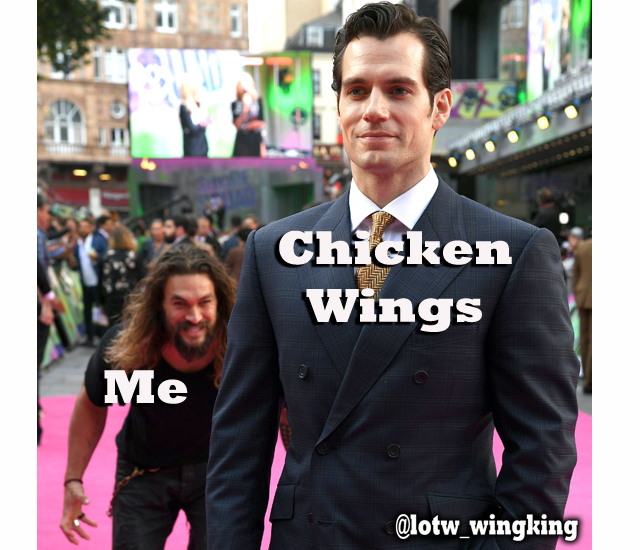 Orders come 10 wings for $30, or 20 wings for $60 at The Ainsworth East Village (64 Third Ave.) and The Ainsworth Chelsea (122 W. 26th St). Showoffs have the option of splurging for 50 wings plus a bottle of Champagne Armand de Brignac — for a whopping $1,000." I'd try them because there actually does sound like some flavour in there ... but at $30 for 10 wings, well actually that's not that much more than some pubs and restaurants already . . . I know I mostly focus on wings around here, but things that are spicy also come on my radar. 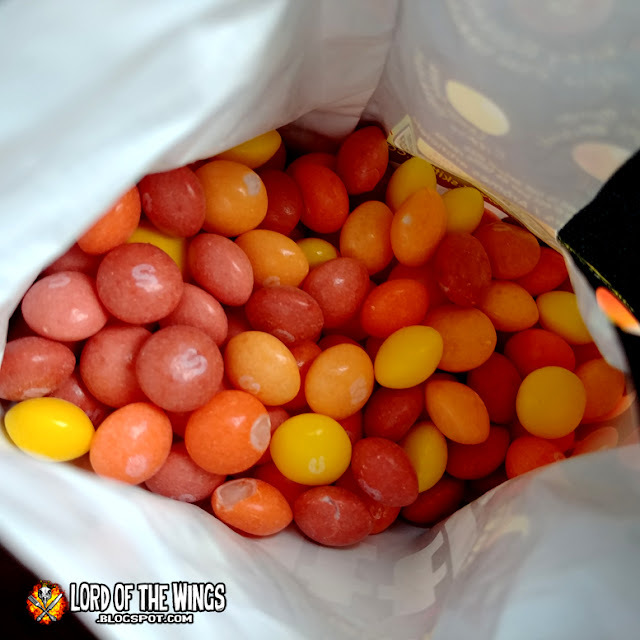 So when I saw Sweet Heat Skittles, I had to try a bag. If the elderly could handle these, then they should be no problem at all. Also, these are Gluten free, so bonus for those with Gluten allergies. The smell was nice and fruity, but the inner bag was not as colourful as I expected. But then I thought about it and these colours are that of fire: orange, yellow, red-dish . . . So how were they? 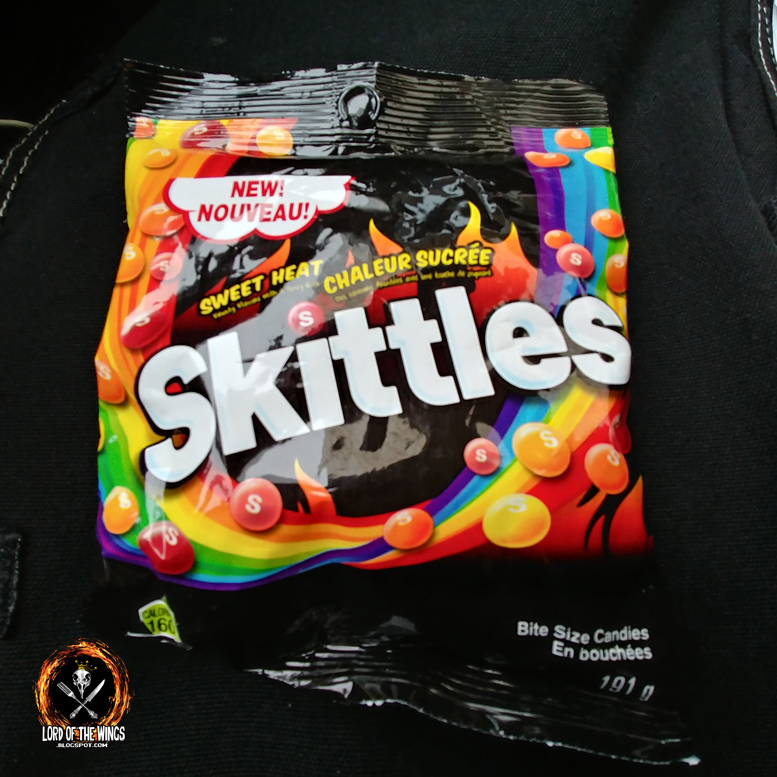 At first, you get that fruity-sugar flavour that is Skittles. You can taste the individual flavours of the strawberry or orange (but I'll be honest, I just down a bunch all at once usually). But after chewing that fruity-sugar flavour, you get this tingle in the back of the throat. Like this peppery kick. But it's not on the tongue or the lips, its this stream of pepper that drips down the back of the throat that does cause some almost coughing. Its' not the sensation I was expecting. I liked them - they are super unique and not like any candy I've had before. You've got that traditional Skittles candy flavour, then some dark pepper going for the throat. 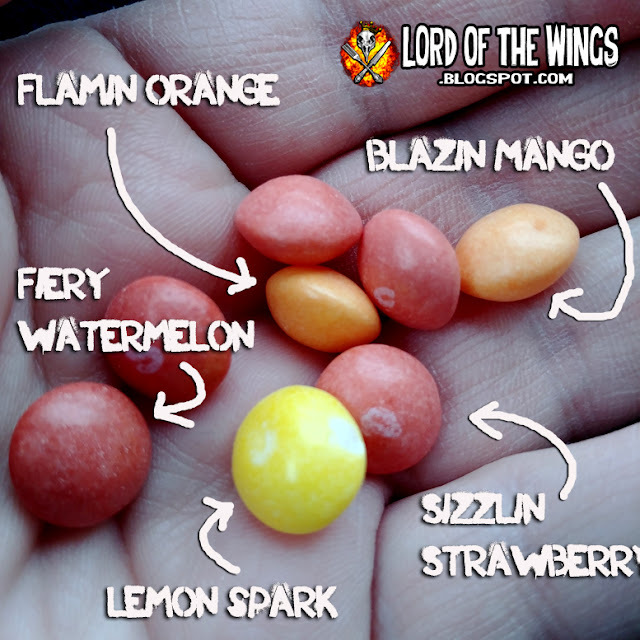 These aren't at the top of my candy list, but I'd get them again. So it's April and mother nature wasn't done with winter. She decided to throw one last winter party before the start of spring and we had a major ice storm on a Sunday. Monday morning we lost power in our apartment, so when it came time for lunch, I HAD to go out to get something. 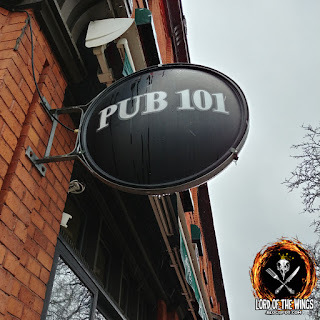 I checked my handy dandy spreadsheet of wing nights in Ottawa I've created, and I saw Pub 101 has AYCE wings on Monday. Boom, decision made. I reviewed the wings at Pub 101 in April of 2009 and I really enjoyed them. I actually went to re-review them when I came back to Ottawa, but didn't get it done so I did a mini-review in my 2016 recap. The place hasn't changed much inside - its a clean pub that's very bright with lots of windows. 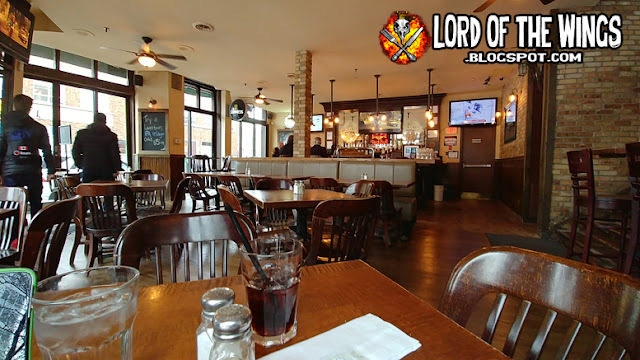 It was pretty dead inside - there was a kid and his dad on vacation in Ottawa, two senior couples (who seemed to be enjoying a noonday drink), and me. Pub 101 is part of a trend of restaurants doing a set price menu's for all their food. The price just went up from $5.01 to $6.21, which is fine considering you get a good size portion. It's a phenomenal deal on meals. And in this economy, a great price for an order or wings. I was here for AYCE wings, but there was no sign of this deal - like no chalk board or signs (just what I had seen on their website). 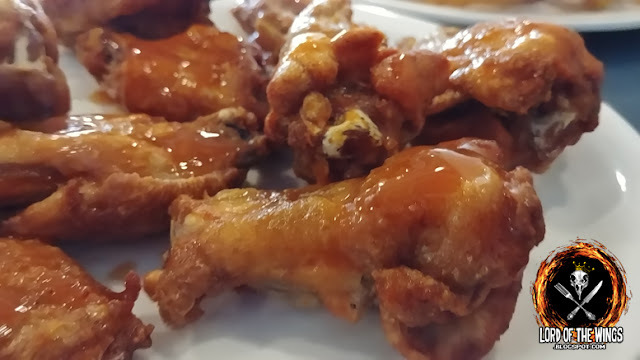 I ordered wings with my waitress, but she didn't say anything about the AYCE deal and she seemed like the type that wouldn't forget. So one of two things was happening: A) They've cancelled the AYCE special (but they still had it in January) or B) It's only a night time deal. I should have asked the waitress to confirm but I felt awkward. Wings only come in single orders, with about 6-7 wings in an order for $6.21. That's if you buy a drink, if you don't, it's $7.21. But you can get any drink, like pop. 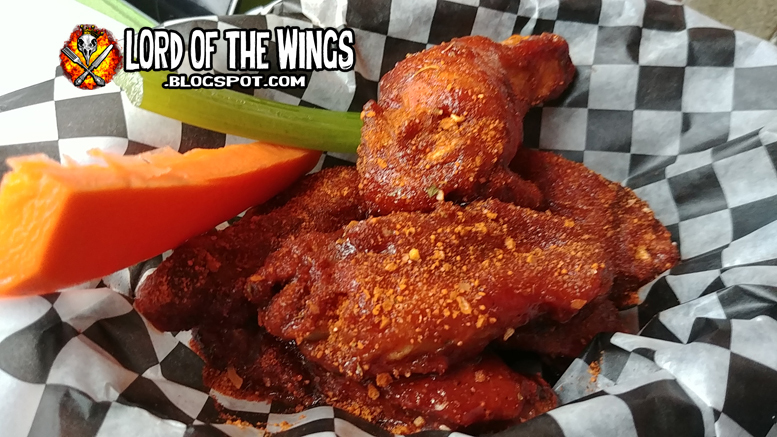 Each order of wings come with celery and carrot sticks, which were firm and fresh. No dip though, although I'm sure you could get some on the side for $1. The wings themselves are not huge - they are about a medium in length and relatively medium in meatiness, but there was some variations in size for sure. The chicken had very tender meat, and the skin was crispy from frying. Overall a well cooked piece of chicken. It also tasted smoked; maybe it was the BBQ in both of my orders, but it added a nice depth of flavour. 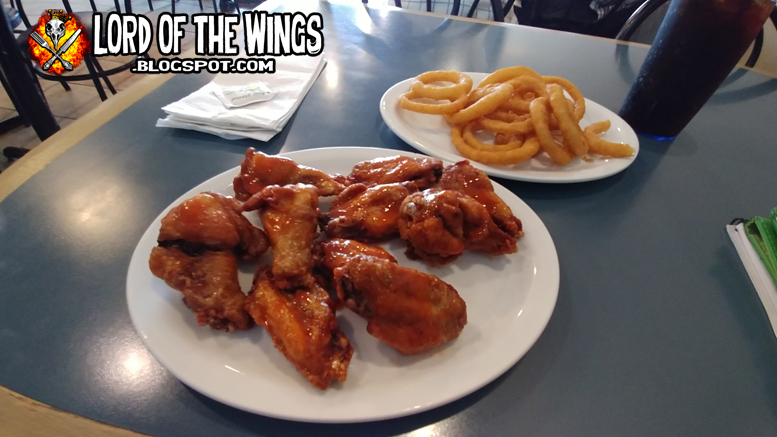 As for sauce, the wings were nice and sauce, but there wasn't much leftover in the basket for extra slopping. 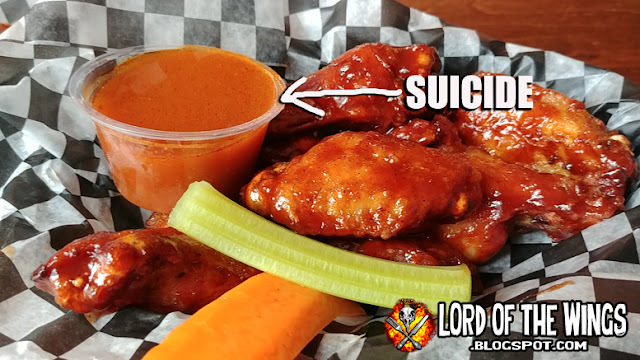 I went with 2 orders of wings, BBQ and Mango Chipotle, but I did get a side of Suicide for $1 for dipping. This was a really unique wing. 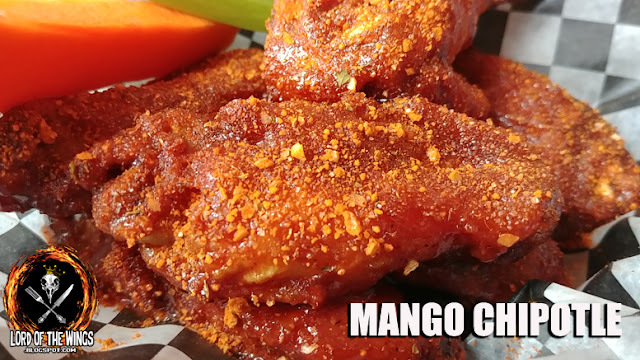 The waitress made it sound like a dry rub wing, but it was like a chipotle bbq sauced wing with a dusted mango? Or maybe it was the other way around. 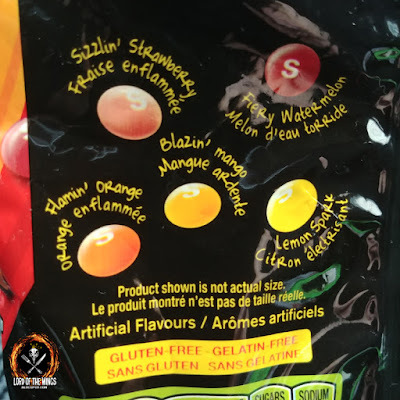 I got a mild fruit flavour but I wouldn't be able to identify the fruit as mango though. It was a bit smokey, sweet, and actually pretty salty (my guess from the dusting). It was really good. I would get these wings again for sure. This was a unique, homemade sauce I think. It had a nice bite, very vinegary. Maybe scotch bonnets? I don't know. I asked the waitress what was in it but she said the kitchen wouldn't tell her. I liked it, but I wouldn't want a whole order of the wings in this sauce - its a good accent sauce. *EDIT - Pub 101 has informed me that AYCE wings on Monday IS after 5pm. Not the best poutine, but still great on a wet, icy, rainy day. Happiness Happened Here - "After Libation"
These chicken wings were so crispy and cooked well. 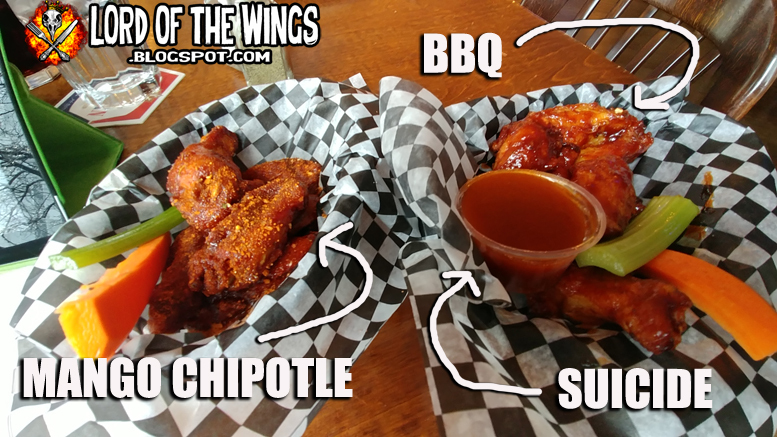 The kitchen messed up and instead of bringing half salt & pepper dry wings and half Memphis Hot, they made them all S&P and Memphis Hot on the side. This worked out well because the Memphis Hot was waaaaay to salty and even lightly drizzled was too much. But those S&P were on point! Go HERE to see the original post. I met up with Ryan (who's been with me on many reviews like Sneaky Dee's or Einstein's) who I haven't seen in over a year since I moved from Toronto. He was in Ottawa on business, but it was great to catch up. 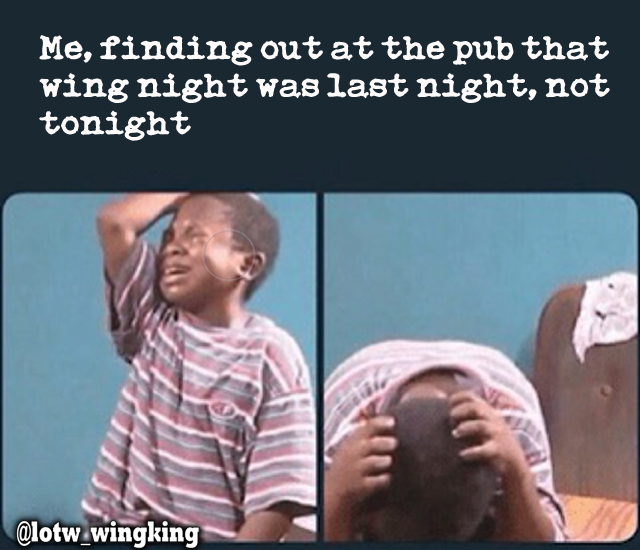 I picked Patty's Pub because its a cozy place that I take people to from out of town, but I was surprised because it turned out to be wing night! There's been a revolution in cinema snacks that have gone beyond the popcorn and candy fare. The movies are competing with Netflix and piracy streaming, so the theatres themselves are getting make-overs with bigger sound, better pictures, recliner seats. The VIP cinemas have recliners with tray tables where you can get served to your seat a burger, jalapeno poppers, club wraps etc. You can even get beer and wine. 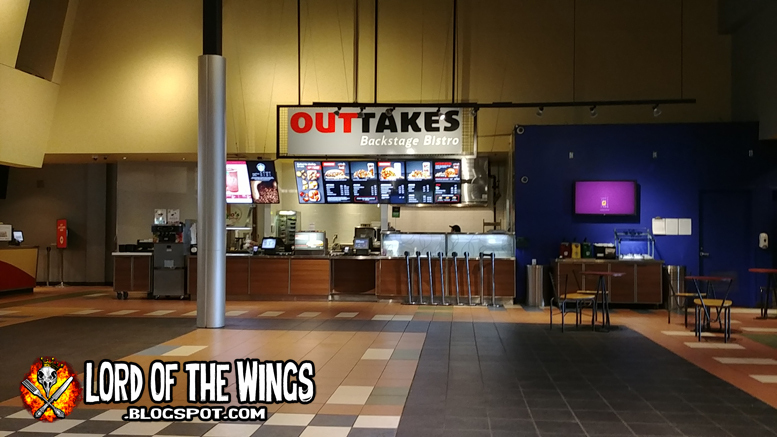 And at this location, you can even order Cineplex food at home with UberEats. It's crazy. My schedule is unorthodox, so I get a chance to hit up matinees, or sometimes, a morning flick. 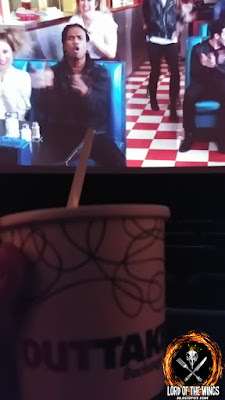 When I got to the movies, I almost always get popcorn, but since this was just before lunch, I was feeling hungry for something more substantial. 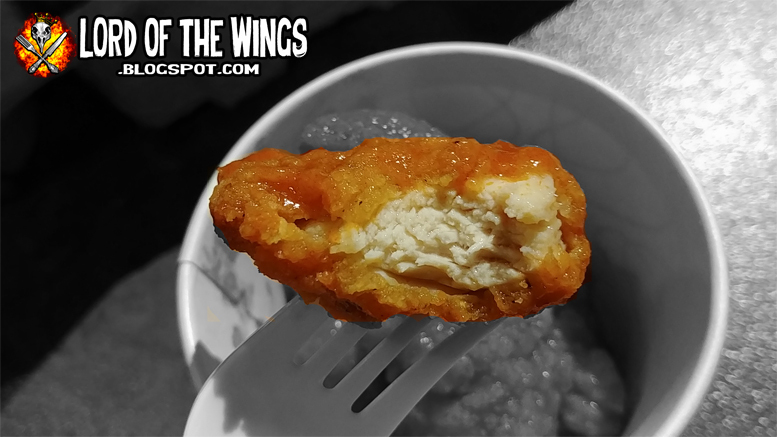 OK so it's not wings, but boneless wings will do in a pinch. They have 3 flavours, Sweet Thai, BBQ and Buffalo. The ads are all for the Buffalo, and to be honest, that's what I was interested in. 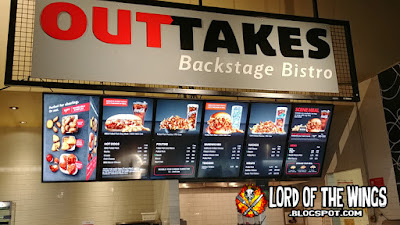 They also had a snack combo that was the chicken, pretzel bites, and mac and cheese bites for just about $10, but I went with the Buffalo Boneless Chicken for $7.99. The staff member told me it would be about 7 minutes because none were ready (again, it was the morning). I heard the fingers go into a deep fryer and sizzle away. 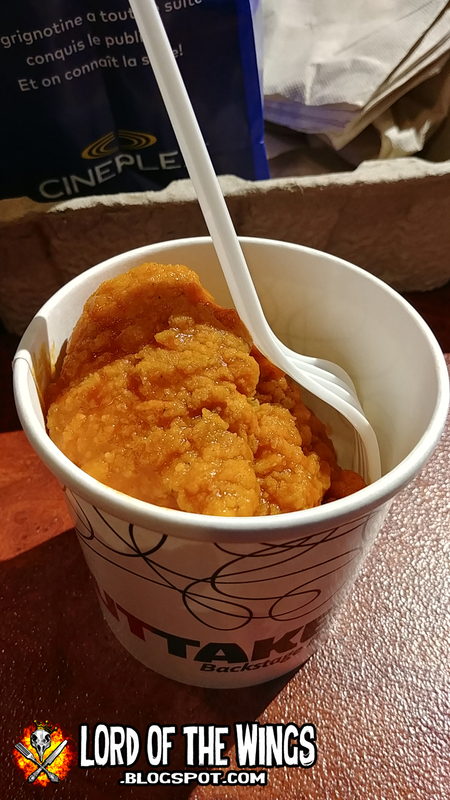 I walked away and got some popcorn (at another stand) but when I returned, the chicken was ready. I watched as they were placed in metal bowl and sauce from a squeeze bottle was drizzled, then tossed over top. Out came a little cup - so very unceremonious, so kinda sad looking. The presentation was really underwhelming. Fortunately, the chicken itself was more impressive. The tenders were all different shapes and sizes, which is nice to know they aren't preformed chicken patties. The above photo shows one of the larger pieces and clearly not a 'bite'. Actually this was awkward to eat with just a fork out of a cup. There were 5 pieces in the little cup. The chicken was crispy, tender, and relatively saucy. The breading on the outside gave a nice little crunch. The chicken was moist and tender. Just as a chicken tender/finger, these were really good. The sauce was lightly tossed - not very wet, but not dry either. 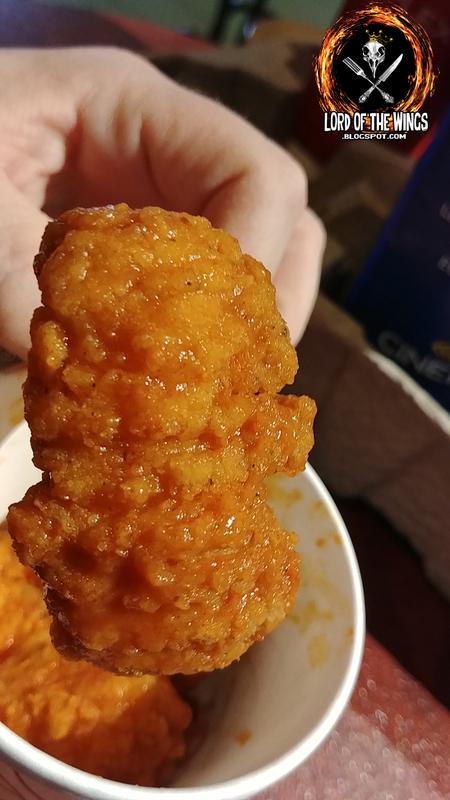 It tasted like commercial Buffalo sauce, but a good quality commercial Buffalo sauce. When I say that, I mean it's obviously not fresh melted butter and hot sauce, but it doesn't taste bad like some poorly made sauces. Of course I got popcorn - layered with butter. Can't watch a movie without it. I also add a Dill powder shaker to enhance my popcorn experience. 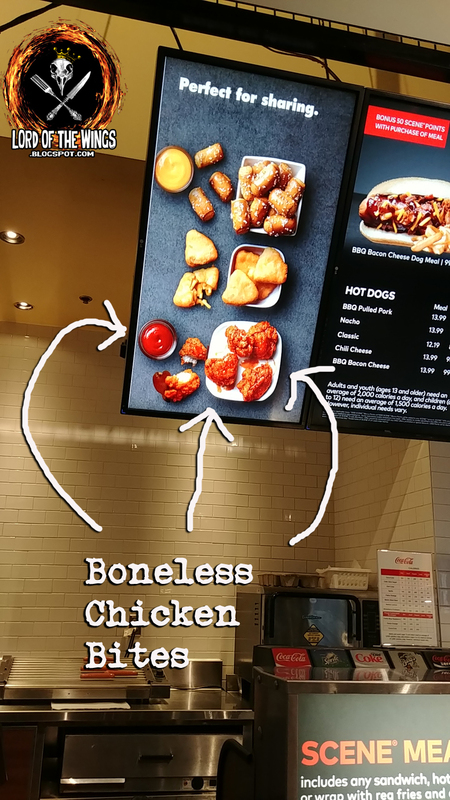 Would I get the Buffalo Boneless Chicken Bites again? Maybe. They were good boneless bites no doubt with their crispy breading and tender meat and decent sauce, but for $8 for 5 pieces, I'll probably pass as a regular snack. 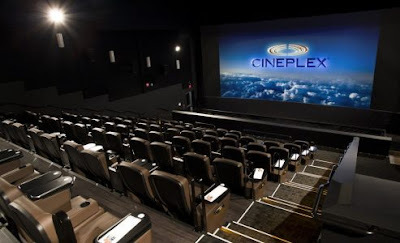 I know food prices are expensive and inflated these days, but what most people don't understand is that a movie theatre doesn't make money on the movies themselves, your admission money goes to the movie studios. The concession stand is where the theatre makes it's money. 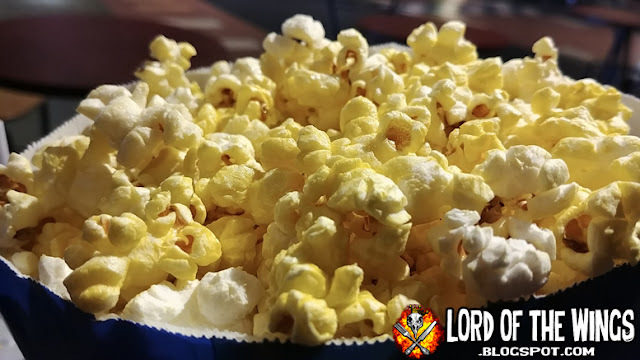 So yes popcorn and pop are overcharged, but that's the price to pay for a superior movie experience ( I just don't understand people that prefer watching a movie at home). Also, don't be the guy who smuggles in a can of pop and cracks it open during the movie. Mini rant over. Those who have survived live by only one rule: never make a sound. Trailer for the upcoming extremely expected, ‘A Quiet Place’. 😧🎥 . ———————————————————————— . Oh, what movie did I see you ask? A Quiet Place. Really recommend it - great atmosphere, superb use of sound and silence, and a unique take on alien apocalypse thriller. Happiness Happened Here: "White Warlock Offering"
Happy Fry-Day the 13th 2018! Happiness Happened Here: "Dust, Death, & Life"
Big News: Adopting a Chicken!! !